A double batch of Mom’s Banana Bread. 2 loaves fresh from the oven. Cream together butter, sugar, eggs and mashed bananas. I like to use 3 bananas when making this recipe. It takes longer to cook, but it has much more banana flavor. 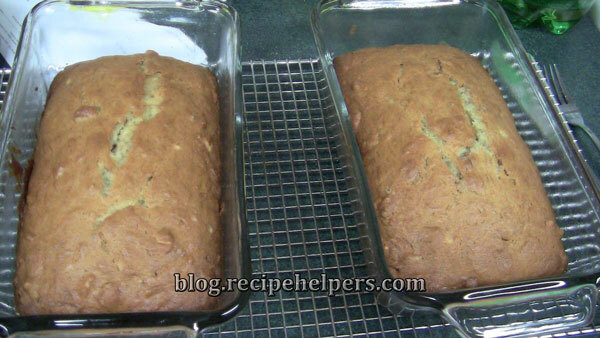 For 3 bananas in the recipe, it takes approximately half an hour longer to bake the loaf. You’ll want to test your loaf to make sure it’s cooked by sticking a toothpick or a fork in to see if any rawness is left inside. If the toothpick or fork comes out clean it’s done. If it comes out with a tiny bit of raw dough, then it can come out because that tiny bit should cook even after it is out of the oven. If the fork or toothpick comes out gooey, then leave it in longer. How gooey will determine how much longer you need to cook your loaf for. Usually try no more than 10 minutes at a time between testing. I also like to cook mine in glass loaf pans. To cook in glass, don’t forget to reduce the temperature by 25°F. So, in this case, that would have you cook your banana bread loaf at 325°F. The same cook-time applies. Whatever you do, DO NOT pour your wet ingredients into your dry ingredients! This will make for a very stiff dough and a very dry loaf. The reason being is because not all measuring cups measure the same amount, even though they have the same measurements marked on them. So, when you mix this dough, be sure to mix the flour mixture little by little into the banana mixture, making sure you don’t make your dough too thick. Banana bread dough should be thicker than cake batter, but not as thick as bread dough. You shouldn’t be able to pick up the dough and handle it with your hands. Walnuts, in my opinion, make this banana bread taste much better, so if you like walnuts, or are not allergic, I recommend using them every time. This banana bread is great whether you eat it cold or warm. I personally like mine warmed with butter or margarine spread on each slice. Freezes well, and can last in the freezer for a long time. It doesn’t usually last though, because it is so good, it gets eaten quickly! Goes well with Banana Buttercream Frosting!